Ford is looking to increase its green credentials with the redesigned 2013 Fusion. The hybrid version of the new midsize sedan, Ford claims, will achieve 47 mpg city and 44 highway, making it America’s most fuel efficient sedan. If the Fusion can achieve those figures, it will best the new-for-2012 Toyota Camry hybrid’s 43/39 EPA ratings, and become the greenest of midsize sedans. Crosstown rival Chevrolet is only offering a mild hybrid system in its 2013 Malibu Eco, expected to get 25 city mpg, and 37 highway. The 2012 Ford Fusion hybrid gets 41 mpg city, 36 highway. Ford’s projections would also make the 2013 Fusion hybrid more fuel-efficient than smaller cars such as the Honda Insight (40/43) and Civic hybrid (44/44). With those figures, Ford might be able to convince consumers to buy a Fusion instead of downsizing to save money on gas. The 2013 Fusion hybrid is powered by a 2.0-liter Atkinson-cycle four which, combined with an electric motor, makes 180 horsepower and 130 pound-feet or torque. It’s based on the EcoBoost range of engines and is connected to a Continuously Variable Transmission (CVT). The car can run on electric power up to 62 mph, a 15 mph improvement over the current Fusion hybrid. 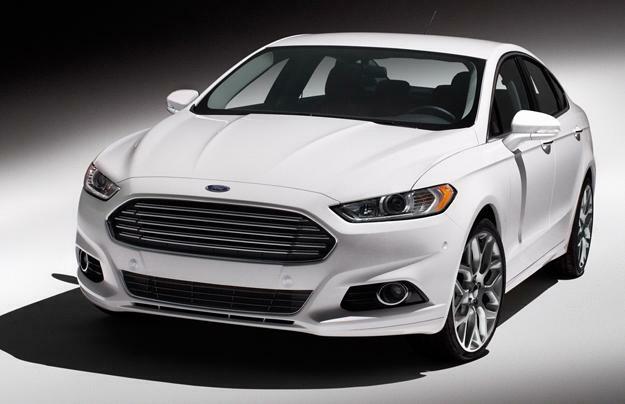 The 2013 Fusion’s rakish good looks also give at a very low 0.27 coefficient of drag. However, the hybrid will not be the greenest Fusion. The Fusion Energi is a plug-in hybrid that Ford also claims will deliver class-leading fuel economy. The Energi’s average MPGe rating is rumored to be over 100, which would put it above the Chevy Volt’s average of 93. It may be harder to reach those numbers in a Fusion than a Volt, though. The Fusion Energi’s gasoline engine engages under full-throttle and at high-speeds (probably at the 62 mph limit of the regular hybrid), regardless of the battery’s state of charge. The Volt engages its gasoline engine as a last resort, when the batteries are down on power. Consequently, the Energi can only drive 21 miles on electricity, whereas a Volt can go 35. That gap could become even bigger if Fusion drivers are too enthusiastic with the gas pedal. Price is another factor.The base price of a 2012 Fusion hybrid is $29,395, putting it near the top of the Fusion range. Ford will have to maintain that price point (or lower it), or people might decide to buy a cheaper model and put the money they save toward filling it up. The same is true of the Energi, which could go for as much as $42,000. Many critics say the Volt, at nearly $40,000, is too expensive; will they change their minds about the Energi? For nearly the same price, buyers will get a larger car, but the Energi will probably seem overpriced if it can’t achieve that magic 100+ MPGe consistently. The conventional and hybrid 2013 Fusions go on sale this fall. The Fusion Energi will arrive in Spring 2013.